(Nanowerk News) UC Davis biomedical engineer Prof. Alexander Revzin has developed a "lab on a chip" device for HIV testing. Revzin's microfluidic device uses antibodies to "capture" white blood cells called T cells that are affected by HIV. In addition to physically binding these cells the test detects the types and levels of inflammatory proteins (cytokines) released by the cells. Revzin's team collaborated with UCLA electrical engineer Prof. Aydogan Ozcan to integrate an antibody microarray with a lensfree holographic imaging device that takes only seconds to count the number of captured cells and amount of secreted cytokine molecules. The test returns results six to twelve times faster than traditional approaches and tests six parameters simultaneously, based on a small blood sample. The Revzin team published the results of their experiments in the May 2010 issue of Analytical Chemistry ("Lensfree Holographic Imaging of Antibody Microarrays for High-Throughput Detection of Leukocyte Numbers and Function"). UC Davis biomedical engineer ProfESSOR Alexander Revzin has developed a "lab on a chip" device for HIV testing. 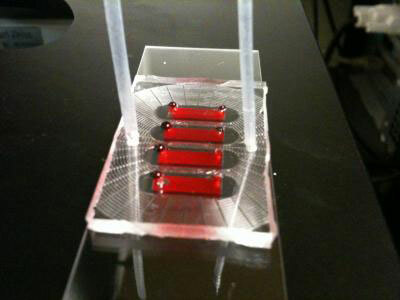 Revzin's microfluidic device uses antibodies to "capture" white blood cells called T cells that are affected by HIV. In addition to physically binding these cells the test detects the types and levels of inflammatory proteins (cytokines) released by the cells. Revzin's team collaborated with UCLA electrical engineer Prof. Aydogan Ozcan to integrate an antibody microarray with a lensfree holographic imaging device that takes only seconds to count the number of captured cells and amount of secreted cytokine molecules. The test returns results six to twelve times faster than traditional approaches and tests six parameters simultaneously, based on a small blood sample. The Revzin team published the results of their experiments in the May 2010 issue of Analytical Chemistry. With further refinements, the test will have wide potential use for multi-parametric blood analysis performed at the point of care in the developing world and resource-poor areas. Its affordability will also make it an attractive option in wealthier areas. Revzin has filed for a patent and is looking for ways to bring his test into clinical use. The HIV test addresses two distinct challenges of blood analysis: 1) capturing the desired cell type from blood, which contains multiple cell types, and 2) connecting the desired blood cell type with secreted cytokines. The test consists of polymer film imprinted with an array of miniature spots. Each spot contains antibodies specific to the two kinds of T-cells (CD4 and CD8) and three types of cytokines printed in the same array. When the blood flowed across the antibody spots, T cells stopped and stuck on the spots. Each T-cell type was captured next to antibody spots specific for the cytokines they might produce. When antibodies activated the cells, spots adjacent to the cells captured the cytokines they secreted. This connected a specific T-cell subset to its secreted cytokines. The visible color intensity of antibody spots revealed differences in cytokine production by T-cells. Prof. Ozcan's lensfree on-chip imaging allowed the scientists to rapidly image and count T-cell arrays without the use of any lenses or mechanical scanning. Analysis of CD4 and CD8 T-cell numbers, the CD4/CD8 ratio and three secreted cytokines took only seconds. In the future, Prof. Revzin envisions adding microarrays to the test that can detect proteins from the HIV and hepatitis C viruses.